Agricultural Economic Insights Has a Cost of Production Advantage for Sorghum Emerged? In several previous posts we’ve taken a look at the trends and excitement surrounding sorghum. From historic production to yield trends and the emergence of a sorghum premium, we’ve covered a wide spectrum of topics. In this week’s post we take a look at the cost of production trends for sorghum over time. Taking a look at the Kansas State University crop budgets for the South Central region, changes in the primary variable input expenses for sorghum and corn were evaluated, figure 1. Primary variable inputs included seed, herbicide, insecticide, and fertilizer/lime. In general, the trends for the two crops appear very similar. Both have the expenses increasing over time with a sharp spike in 2009. A closer look at the data, however, shows that the primary inputs for corn (blue) increased at a faster rate than sorghum (orange). This is illustrated with the trend lines. For sorghum, primary inputs increased $4.77/acre per year while increasing $8.31/acre per year for corn. Over the 15 year period, this difference in annual change resulted in corn variable costs increasing $53 per acre more than sorghum. To look at the changes in another way we compared the expenses across two time periods. The average of the expense from 2001-2005 was compared to the average of the expense from the 2011-2015 period. For sorghum, the primary input expenses increased 73% from 2001-2005 to 2011-2015 while corn increased 88%. Figure 1. Budgeted Expense for Primary Inputs (Seed, Fertilizer, Herbicide, and Insecticide) for Corn and Sorghum in South Central Kansas. 2001-2015. Data Source: Kansas State University/AgManager.info. Recent years have seen renewed optimism in sorghum. After decades of declining acres and slow gains in yields, recent excitement about the crop was met by strong prices. Subtly a cost of production advantage for sorghum also appears to have been developing. While the cost of production for both sorghum and corn has been increasing in recent years, sorghum costs have not increased as significantly.When looking at the budgets for the variable inputs (seed, fertilizer/lime, herbicide, and insecticide), costs in South Central Kansas increased at a slower rate for sorghum. Over 15 years the impacts became substantial. As we mentioned with earlier posts, producers should carefully consider their unique situation and evaluate how significant and sustainable they believe any economic advantages sorghum may generate for their operation. It’s worth noting that much of the sorghum premium quickly evaporated earlier this year. However, sorghum basis is still stronger (higher) than in 2014 and the average from 2004-2013. 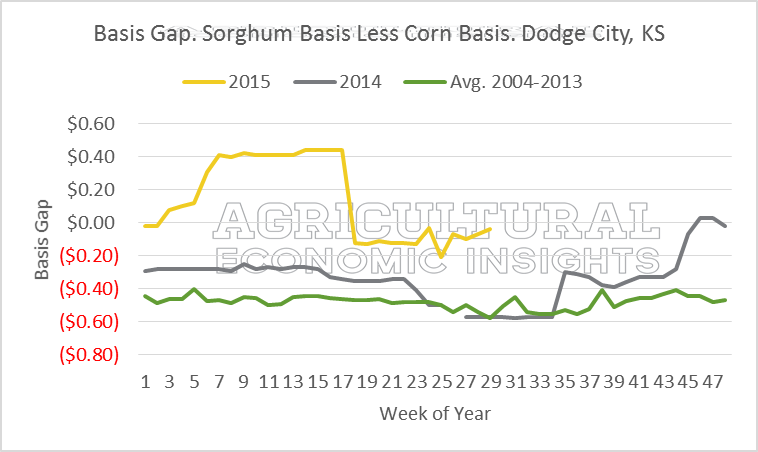 Furthermore, the basis gap between sorghum and corn (sorghum basis less corn basis) has recently favored corn but not as much as in the past. 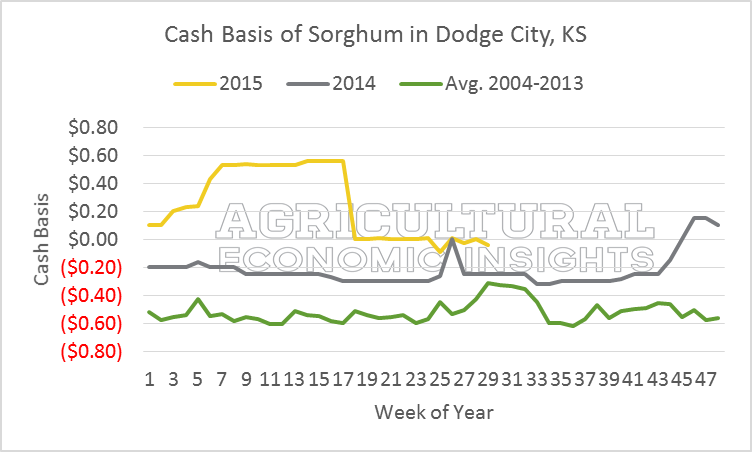 So while sorghum cash prices are currently less attractive than earlier in 2015, they are still above historic expectations.